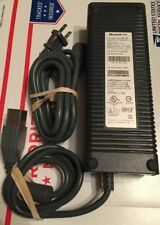 Official Microsoft XBOX 360 203 Watt 203W Power Supply & Wall Cord DPSN-186EB A. Condition is Used. Shipped with USPS Priority Mail. AC Adapter. Power Cable. Owner's Manuals. Tested for full functionality and works perfectly fine. Both wires have been tested and verified working. Platform: Microsoft Xbox 360. Category: Xbox 360. Type: Power Adapter. Original accessories may or may not be included. Notes: Works great, but has a crack on it that doesn't affect performance. Works great, but has a crack on it that doesn't affect performance. Do not buy a knock off! They will not last and are noisy. This is the real deal straight from Microsoft. TESTED AND WORKS. Only what can be seen in the pictures is what's included. ~~~~~~~~~~~~~~~~~~~~~~~~~~~~~~~~~~~~~~~~~~~~~~~~~~~~~~~~~~~~~~~~~~~~~~~~~~~~~~~. Official Microsoft XBOX 360 203 Watt 203W Power Supply DPSN-186EB. Condition is Used. Shipped with USPS Priority Mail. Tested and works great. As pictured. XBOX 360- GENUINE OEM OFFICIAL 203 w watt POWER SUPPLY BRICK-CORD FREE SHIPPING Condition is Used. Shipped with USPS Priority Mail. It can also be used on all first generation Xbox 360s. This is the real deal straight from Microsoft. These are very rare, especially new in the original box. It will fit all the original first generation consoles: Xenon/203, Zephyr/203, Falcon/175, Jasper/150! Item is in good condition and will ship in 1-3 business days! Thanks! XBOX 360- GENUINE OEM OFFICIAL 203 w watt POWER SUPPLY BRICK-CORD DPSN-186D A. Condition is Used. Please see all pictures and bid accordingly. Thank you for looking and good luck. Shipped with USPS. .
Official Microsoft XBOX 360 - 203 Watt 203W Power Supply Wall Cord USED 0222. Condition is Used. Shipped with USPS Priority Mail. 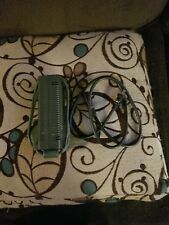 Used Xbox 360 power supply w/ cord. XBOX 360 Gen 1(fat)Microsoft 203 w watt POWER SUPPLY. Condition is Used. 1 USED XBOX 360 AC ADAPTER. TESTED AND WORKS. Only what can be seen in the pictures is what's included. ~~~~~~~~~~~~~~~~~~~~~~~~~~~~~~~~~~~~~~~~~~~~~~~~~~~~~~~~~~~~~~~~~~~~~~~~~~~~~~~. Suitable for powering all original Xbox 360 consoles in Australia. It can also be used on all first generation Xbox 360s. Does not include cable from wall to power cord. P lease examine pictures of the plug to make sure this is the right fit for your model. So make sure you have the proper 3 prong cord if you plan on using it.